During the winter months, ice can destroy your docks, piers, piles, and sea walls. 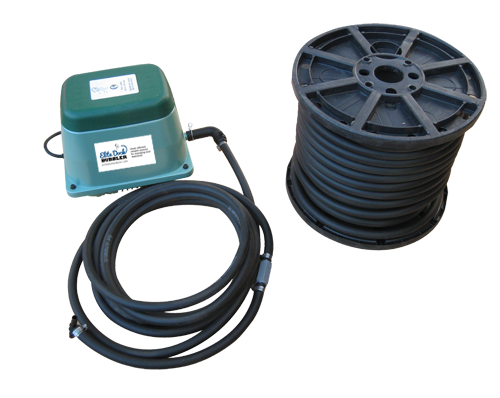 Elite Dock Bubbler systems help prevent dock uplift, as well as pile, bulkhead, and crib damage. From a single waterfront dock to a complete marine facility, there is an energy efficient, dependable and durable bubbler system designed to meet your needs. The Elite Dock Bubbler System features a silent air pump with a weather resistant, aluminum housing that enables better ventilation and easier maintenance. • High density flexible tubing that doesn't crack, lasts longer and can be left in the water year round. • Our product does not use fans. This means there is no concern for weeds tangling and seizing the motor or causing harm to wildlife. • Clean, oil-free flow air pump. • More dependable than fan systems. • Uses less electricity than other systems. • Optional thermostatic control outlet saves energy and life of the system by allowing it to shut off when temperature reaches a designated level. • Parts are easily replaceable when needed. • Systems available to protect bulkheads and pilings as well as boats that are left in water year round. • One year manufacturer warranty on all of our systems! The Elite Dock Bubbler systems do not guarantee complete prevention of ice or other weather damage to your dock or waterfront. Other factors such as surrounding nearby properties, extreme weather conditions, and natural disasters must be taken into consideration.